I am always looking for healthy snacks that are high in protein and... oh yeah... taste good too. 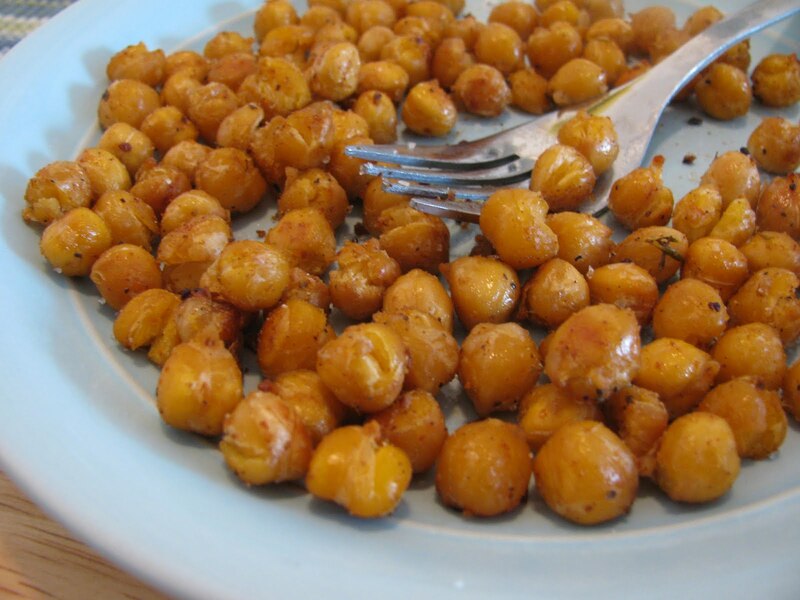 I found these roasted chickpeas on a few blos, and tried them this week—oh man, are they good!!! I told Mahon, "They taste like they shouldn't be healthy..." but they are. So indulge yourself! They are such an awesome combination of crunchy outside and creamy inside. Preheat oven to 425-450 (if your chickpeas are very soft, the higher setting will work better). Line a rimmed baking sheet with foil. In a bowl, toss the chickpeas, olive oil, and seasonings together (I've been using my Creole seasoning again and LOVING it on these, but I plan to try different things as well—I have even seen some done with cinnamon sugar!). Spread coated chickpeas onto pan, making sure that they are not on top of each other. Bake for 15-30 minutes, depending on how hot your oven gets and how crunchy you want them, stirring occasionally. I usually will put them in for 10-15 minutes, stir them, and then check them in 5 minute increments after that so that they don't burn. I take them out when they no longer feel soft and squishy to the touch, and when my "test chickpea" tastes a bit crunchy on the outside. Ever since I heard of these a few months ago, I've been wanting to try them. Thanks for sharing how you make them. They are so delicious! In fact, I have some chickpeas going in my crock pot right now so that I can make some more. YUM!!! I love chickpeas. I'm going to make this tomorrow. You will not regret it! I am making these, ahem, every afternoon lately. I made some and loved them. Some of the kids ate them with ketchup, but not me. I ended up making some to take to my sisters but they got soft. She heated them back up in a frying pan to crisp them up, and she said they were good that way. Do you have any other suggestions on how to store them or are they just better fresh and crisp? Jeannie, I ran into the same problem last week - I tried to take some in a tupperware to eat while I was at the farmer's market. NOT yummy! I haven't experimented much with storing them, but I think the frying pan reheat sounds like a good idea... I will have to try it! The one time I did have some leftover I put them in the fridge and threw them into my stir-fry the next night (along with broccoli, carrots, peas, sesame seeds, & brown rice). THAT was delicious.